There is more swing or freedom of movement in a composition when balance is felt intuitively rather than when having followed strict rules, but having a basic knowledge of some guidelines is always useful when making our own compositions, this is particularly true to Still Life paintings. 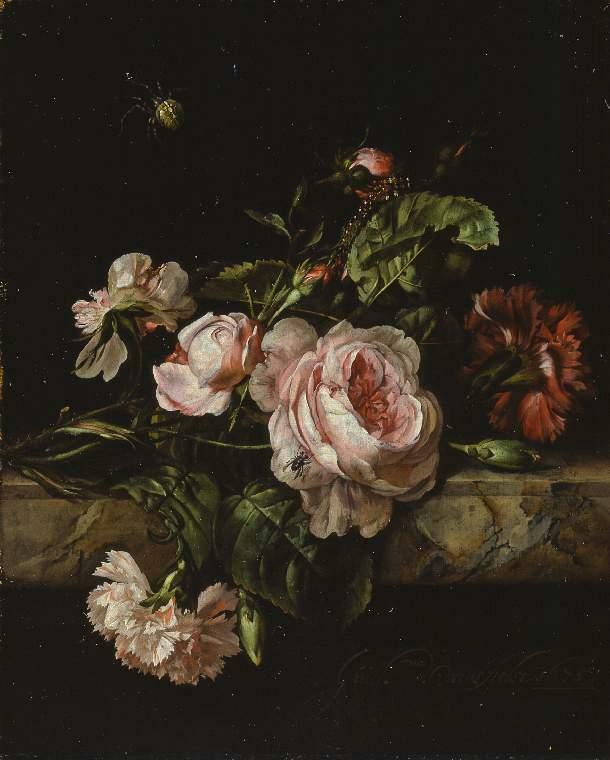 The painting below made by the Dutch artist, Willem Van Aelst, is a simple arrangement where the stem of the main foreground rose, the rose itself and the red carnation facing backwards form a flat S shape which is very pleasing. The three light pink flowers above the marble structure are balanced by the downward facing carnation, the four of which form a stable triangle. S formations and triangular compositions are very common in Still Lifes. This painting is a very complex assymmetrical composition arranged marvellously by the renowed Dutch artist, Gerard Van Spaendock. It consists of a lavish group of flowers and foliage arranged in a basket along with aan alabaster urn on a marble pedestal. We can make out the triangular composition where the structure at the right forms one side of the right-angled triangle, the marble pedestal forms the base side and connecting the tip of the urn on the right with the tip of the marble structure on the left forms the diagonal side. The edges of the flowers and the foliage also lie on this diagonal. 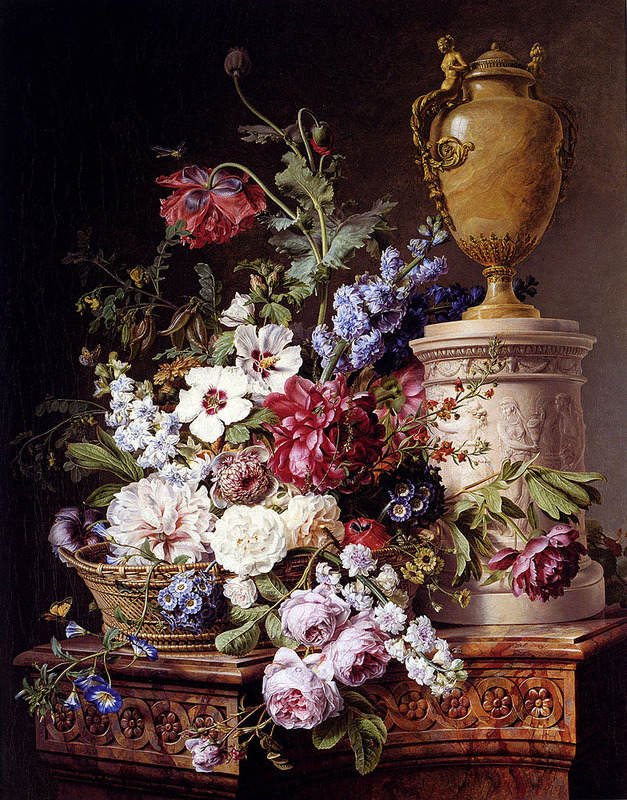 The urn on the right seems heavier than the group of flowers on the left but notice that the top left hand side has a very dark background. This is how the visually-heavier dark value on the left balances the heavy object in terms of weight on the right. Color, value,weight of objects, size or area all have visual weights and by placing them on an imaginary physical balance in our minds, we can bring refinement to our compositions. Smaller flowers and tiny buds are made to support the larger heads of flowers and intercepted by twigs and vines to scatter or diffuse the composition, to add interest and variety and keep the eye moving about the whole picture. 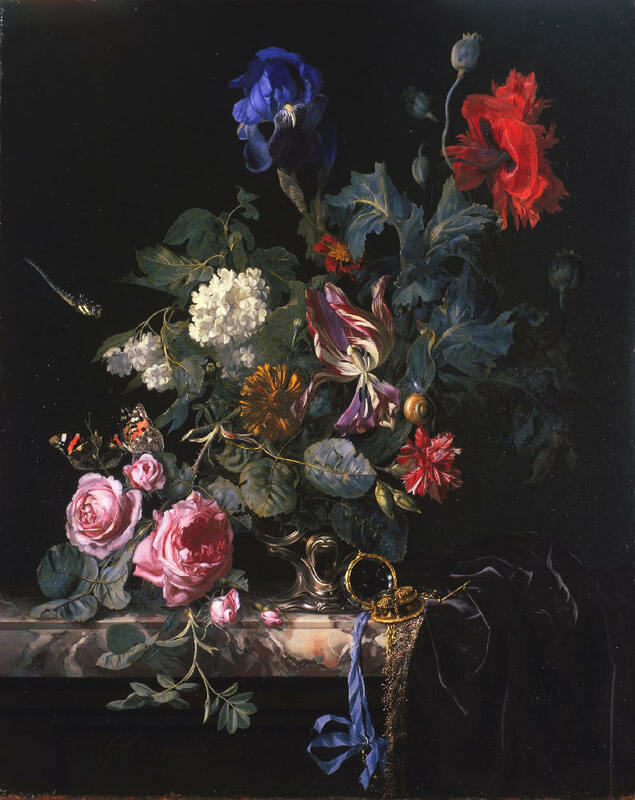 Dragonflies, butterflies, a fly and a beetle placed strategically add to the opulent extravagance of this composition. The painting below, is made by Cornelius van Spaendonck, brother of Gerard van Spaendock. This painting is exceptional not only in its composition but also in his treatement of light. Notice how the eye is pulled first towards the area of the three light colored roses and the brightly lit urn. From there, he has diffused the brightness of the light radially towards the edges. The lilac branch is made progressively darker as it moves upwards, the same is true for the blue sprig of flowers just below the lilacs, the peony, the brown urn at the bottom, the grapes and grape leaves at the right etc. In this way, the eye is made to move softly from the outer edges to the centre and focus on the roses. The large, red peony and its leaf balance the larger group of flowers diagonally towards their right. The morning glory twig connects the two urns gracefully. If you have a large mass of flowers, its important that the vase or urn holding them appears stable and large enough to support the flowers and not look as though it would topple over. This painting is an unusual composition but one that still works well. The main area of interest consisting of the pink roses, rose buds and butterflies is placed quite low, at the lower left hand corner. The eye meanders up, to the white lilacs, white and red striped tulip; the red poppy pulls the eye upwards to the right corner and from there it moves towards the left to the blue iris which is not as strident as the red poppy. 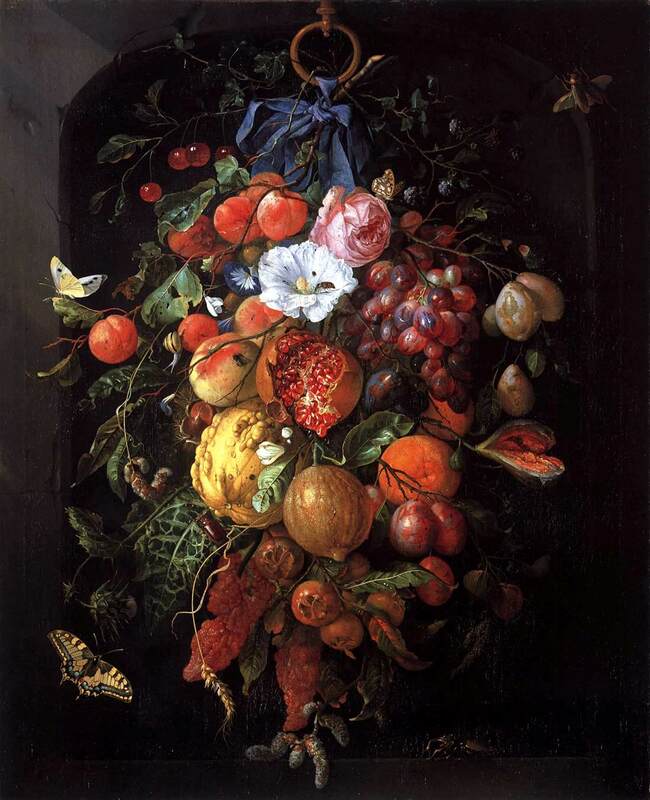 This painting consists of a luscious arrangement of fruits and flowers by Jan Davidsz de Heem. 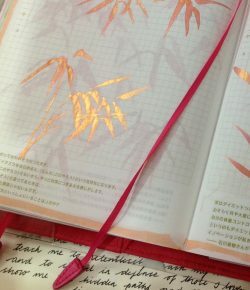 It is a symmetrical composition, the two shapes on either side of a vertical line drawn through the centre are near identical as it forms an oval shape. But this symmetrical composition is anything but monotonous, it is delightfully varied and absolutely seething with activity, with butterflies, moths, beetles and flies darting about in every direction. This festoon is suspended from a bronze ring and tied with a blue ribbon. The textures are beautifully rendered, from the rough skin of the lemon, the glittering water drops, spilling pemogranate seeds, soft centifolia rose, shiny cherries and grapes. The elements at the front, closest to the viewer, brightly lit up and gradually disappearing as they recede, the realisitic textures and darting insects all give us the impression of the whole mass as being real and alive and breathing.